The Japan Young Surveyors Network, in collaboration with the FIG Young Surveyors Network, are happy to invite you to the Young Surveyors Network Asian Pacific Meeting in Japan held on the 15th – 16th June 2018. Asian Pacific young surveyors meet up in Japan and improve our network. The FIG Foundation supports the meeting to invite developing countries Young Surveyors to come. This two-day meeting will be benefit to any young surveyors who have graduated within tye last 10 years or who is a student. We have invited several professional young surveyors from different organizations, and the expert professionals for the STDM etc. Note: The maximum number of participants is 80, so don't hesitate an make a registration! Since the beginning of the FIG Young Surveyors Network, Japanese Young Surveyors have been actively participating in various meetings, trainings and activities. The Japanese Young Surveyors play an important role in the Asian Pacific region but also at a global level. At regional level the Japanese Young Surveyors Network is continuously promoting the profession. After the attendance of a STDM Training of Trainers the Japanese Young Surveyor Network was leading the translation of the UN-Habitat GLTN STDM booklet. Finally, FIG YSN has started the Volunteer Contribution Surveyors Program since 2017 and more Asian Pacific Young Surveyors try to join the project. The other side - the 7 years past from the East Tohoku Big Earthquake, Young Surveyors know a role as a surveyor. We are going to share the knowledge of recovery from the disaster and what we should do when it happens and discuss with all of surveyors about our future on this meeting. It is on!!! 2nd FIG Young Surveyors North American Meeting (FIG YSNAM)!!! It is a great honor to announce the 2nd FIG Young Surveyors North American meeting in Minneapolis, Minnesota USA on February 10, 2016 and we want to invite you to join us in the second celebration of this encounter. The meeting will be held in conjunction with the Minnesota Society of Professional Surveyors (MSPS) Annual Conference. We are excited and looking forward!!! The 3rd Young Surveyors European Meeting was held in sunny Sofia, Bulgaria on the 16 May 2015. About 50 keen young professionals from 20 countries gathered together to share and explore new ideas, address pressing issues and focus on the future development for the European YS Network. The UN-HABITAT Global Land Tool Network, International Federation of Surveyors (FIG) and FIG Young Surveyors Network would like to invite Young Surveyors, Young Land Professionals and Youth working in related fields to apply for participation in the Social Tenure Domain Model – Training of Trainers. Deadline to apply is 12 October 2014. It gives us great pleasure to invite Young Surveyors to our 2nd FIG Young Surveyors European Meeting in Berlin, Germany on 7th October 2014. The meeting is jointly organized by FIG Young Surveyors Network and KONGEOS (Conference of Geodetic Students) supported by FIG, FIG Foundation, CLGE, DVW, BDVI and OE. We are cordially inviting Young Surveyors/Professionals and youth to apply for participation in the Social Tenure Domain Model – Training of Trainers. The 3.5 days training will be organized as a joint activity by International Federation of Surveyors (FIG), Global Land Tool Network (GLTN) and FIG Young Surveyors Network (FIG YSN). Deadline to apply is 6 April 2014. Following the success of the 1st FIG Young Surveyors European meeting, we are pleased to announce the 1st FIG Young Surveyors North American meeting! Join the meeting. The Trustees of the Aubrey Barker Fund have announced that the fund will consider applications from student organisations within the field of land surveying, quantity surveying and land economy to support student meetings. 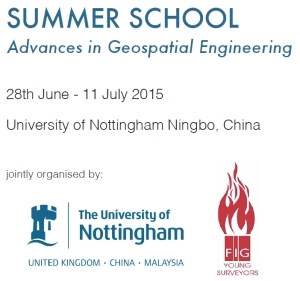 Land surveying can be interpreted as including subjects now generally described as geomatics. Funds to support student meetings can be used as travel bursaries to attend the meeting, to support tutors on training courses, or for specific costs in setting up a conference or training course. Applications can be made at any time and should include details of the meeting for which support is needed, a justification for support, and a cost breakdown of how the money applied for would be spent. . The Aubrey Barker Fund was set up in March 1972 in memory of Aubrey Barker, a distinguished surveyor from Guyana who was president-designate of The Commonwealth Association of Surveying and Land Economy (CASLE) but who died before taking office. Colleagues throughout the British Commonwealth contributed to a fund to be used to support education, training, research and projects related to the disciplines of land surveying, quantity surveying and land economy. The Fund has helped students to attend courses and carry out projects and the trustees also organize an essay competition. Books and equipment have been provided to colleges in developing countries. The FIG Foundation Young Surveyors Fellowships will provide funding for individuals to cover the costs to attend and participate in the 2014 FIG Congress in Kuala Lumpur, Malaysia, including attendance at all FIG Young Surveyors events during the congress. The XXV FIG Congress will be held in Kuala Lumpur, Malaysia, 16-21 June. In addition to congress events young surveyors sessions will be organised and contribute to the networking of young surveyors internationally, to introduce young surveyors to the FIG Congress and FIG community, and to provide for the opportunity to learn more and share the young surveyors’ vision for the future of FIG. before 1 December 2013. Late applications will not be accepted. I was interviewed recently and one of the questions raised relates to Youth. My response was the youth of today is the adult of tomorrow and the belief is that if we can more effectively address the issues, concerns and aspirations of the youth today, we could perhaps have a more dynamic and productive tomorrow. This belief equally applies to the Young Surveyors of today. Read more..
Finnish Young Surveyors Network (YSN Finland) received the award from Surveying Engineers Association of Finland in national surveying days that was held in April 2015 in Espoo, Finland. 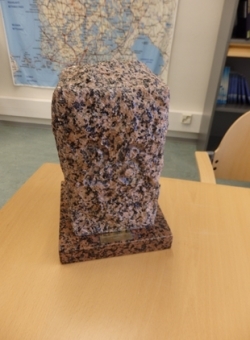 As an award YSN Finland got a stone pole number 26. Pole is like boundary mark, but smaller. YSN Finland is established by Lapland University of Applied Science-Land Surveying Engineering students. The Finland’s Young Surveyor Network was awarded because it has purposefully worked to establish and maintain a land surveyor identity. This is even more important nowadays when the surveyor’s remit is wider than ever and the land surveyor degree program is distributed with other study degree programs. YSN Finland has been nationally and internationally very active and thus given rise to contacts between the Finnish and international surveying organizations. The founders of YSN Finland are Lapland UAS land surveying students, Tuomas Jylhä and Niko Haaraniemi. 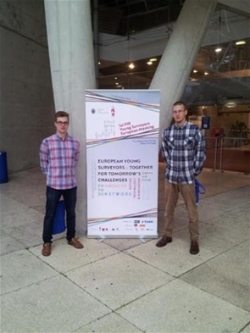 They got the idea of establishing the national network for land surveyors after participating the European Young Surveyors meeting in Portugal, October 2014. African Young Surveyors are invited to apply for FIG Foundation Young Surveyors Scholarship to attend FIG 2013. The FIG Young Surveyors Network and the FIG Foundation would like to invite African Young Surveyors to apply for funds to attend the FIG Working Week 2013 in Abuja, Nigeria. The 2012 FIG Working Week to be held in Rome, Italy, will be the first FIG Working Week to host an additional Young Surveyors Conference immediately prior to the main Working Week events. The FIG Young Surveyors Conference will be held on the 4-5 May 2012, hosted by the National Council of Italian Surveyors, whist the full Working Week will run from 6 – 10 May. The aim of the additional young surveyor sessions will be to further the network of young surveyors internationally, to introduce young surveyors to the wider Working Week, and to learn more of the young surveyor vision for the future of the FIG. FIG Foundation has decided to cover up to four (4) Fellowships, to cover the costs of travel, accommodation during the FIG Young Surveyors Conference and FIG Working Week and conference registration. Fellowships include attendance at the FIG Foundation Dinner, the FIG Gala Dinner and Commission dinner. The 2012 FIG Foundation Young Surveyor Conference Fellowships will provide funding for individuals to cover the costs to attend and participate in the 2012 FIG Working Week in Rome, including attendance at the FIG Young Surveyor Conference.